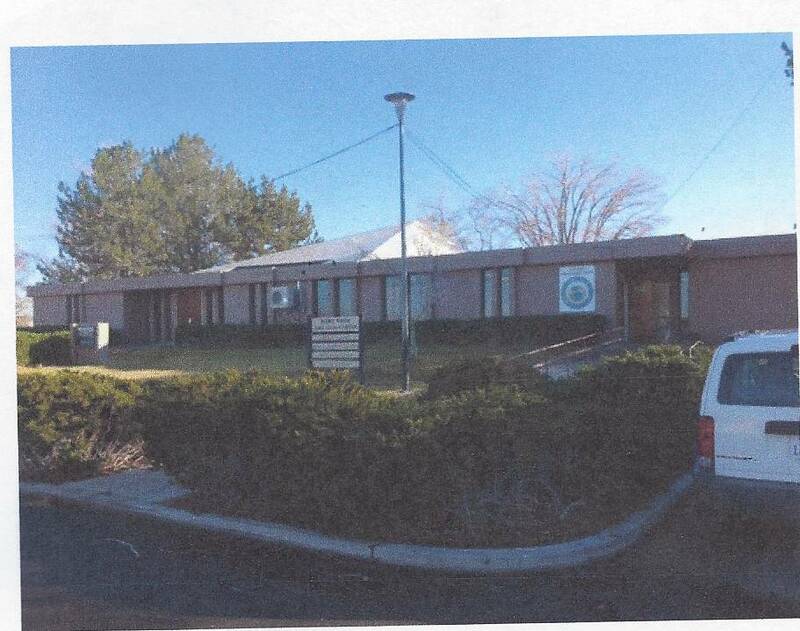 The Lassen County CAO deceived everyone, including the Board of Supervisors, about the three One-Stop remodels in Lassen County. The $788,000 Proposition 63 Funds were spent by October 15, 2015. There are no funds to remodel the Herlong, Westwood, or Big Valley One Stops. In a November 15, 2015 e-mail to Kan We Help, Melody Brawley, confirmed that all the Proposition 63 Funds were in Fund 164.The Auditor also confirmed that the "restricted" Proposition 63 Funds were deposited and spent in Fund 164. Kan We Help requested and received an 86 page printout of the available financial activity from Fund 164 (6/13/11 to 12/28/17) from the Lassen County Auditor. This printout indicated that Fund 164 (Proposition 63 Funds) was overdrawn by over $300,000 as of December 28, 2017 and numerous anomalies need further explanations. This deception falls on the shoulders of the County Administrative Officer. The Lassen County CAO tomorrow, February 13, 2018, will attempt to revise the Budget to shift funds between categories to hide the fact that the One Stop remodeling funds have been spent. In 2004, California voters approved Proposition 63 which generated funds to improve mental health services for the un-served and underserved. In 2009, there was an amendment to the Welfare and Institutions Code (Section 5891 and 5892), Mental Health Services Act. The Fort Sage One-Stop in Herlong has an interesting past. Under former Supervisor Jack Hanson, this facility received a new roof and various repairs and benefits under the Lassen County Local Re-use Authority. The LCLRA was created when the Army gave Lassen County Herlong and the Sierra Army Depot Amedee parcels. 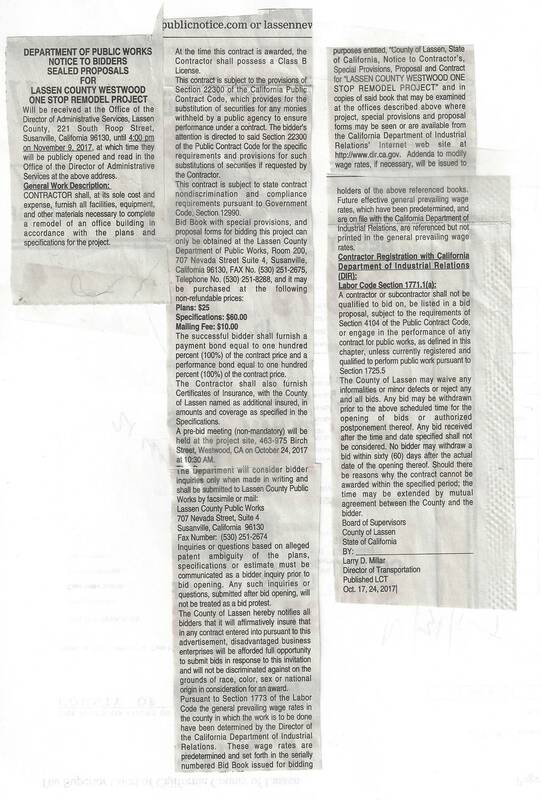 When the LCLRA was dissolved, no more funds were available to pay the mounting bills at the Fort Sage One-Stop. 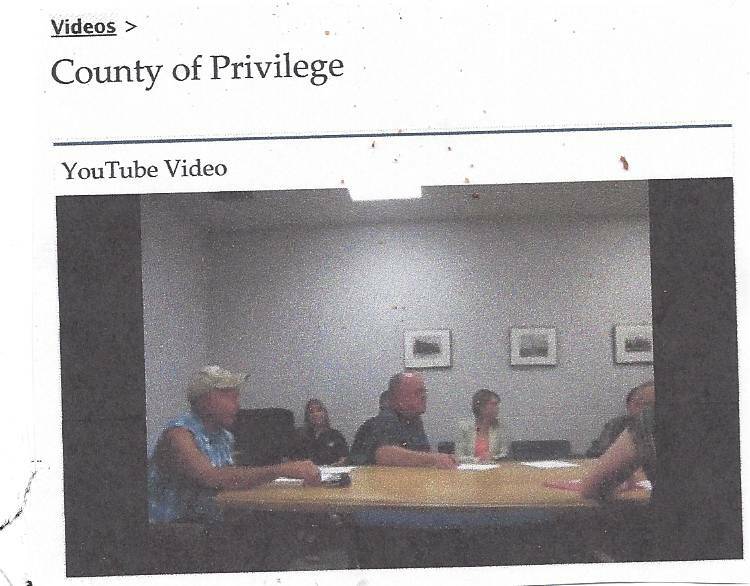 Lassen County eventually included the Fort Sage One-Stop in the "give-away" of this Army land to HSP Resources (Hal Hayes, Larry Smith and Steve Pezzullo) illegally. The Fort Sage One-Stop had to eventually be returned to Lassen County. Lassen County again, had the responsibility of maintaining this building. On March 18, 2013, the Lassen County Supervisors began the illusion of remodeling the Bieber Big Valley One-Stop. 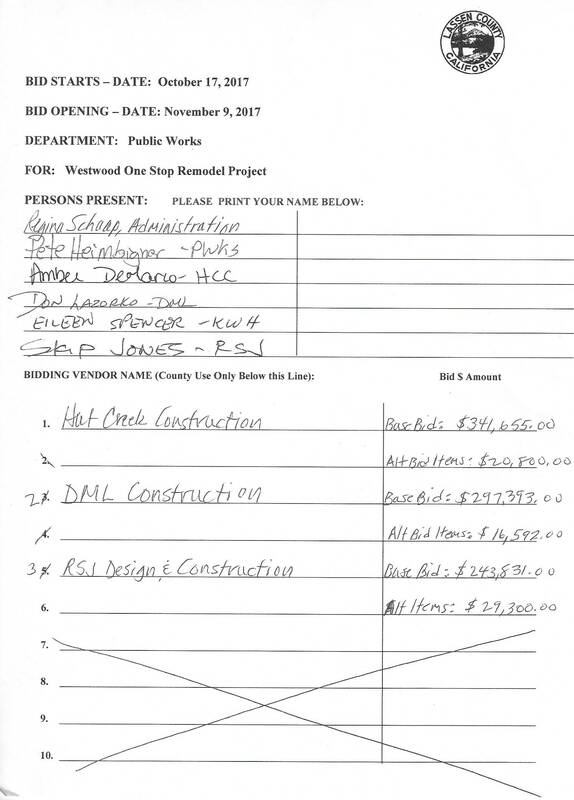 Lassen County spent $68,886.25 (Prop 63 funds) on "plans" (NST Engineering, Semingson Architects) that they never, ever intended to use. 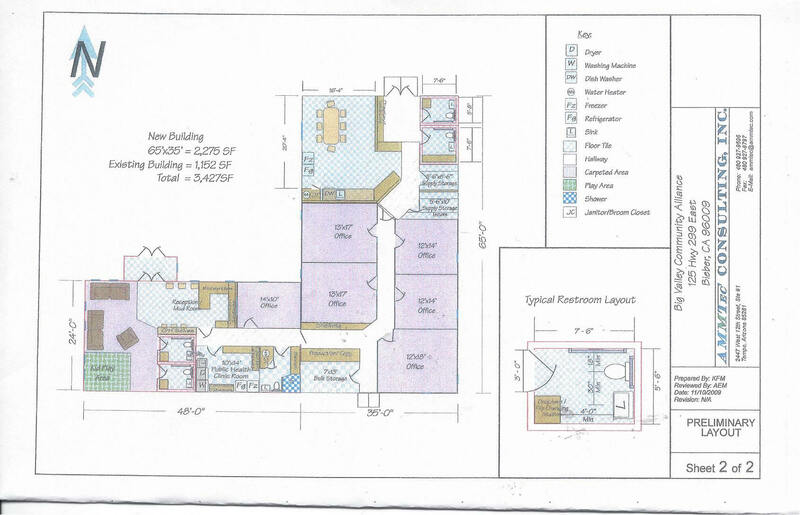 At the November 17, 2015, the Board of Supervisors meeting (Agenda H-1) plans were presented, to the Board, to purchase a triple wide mobile building that could have been installed within 3 months. 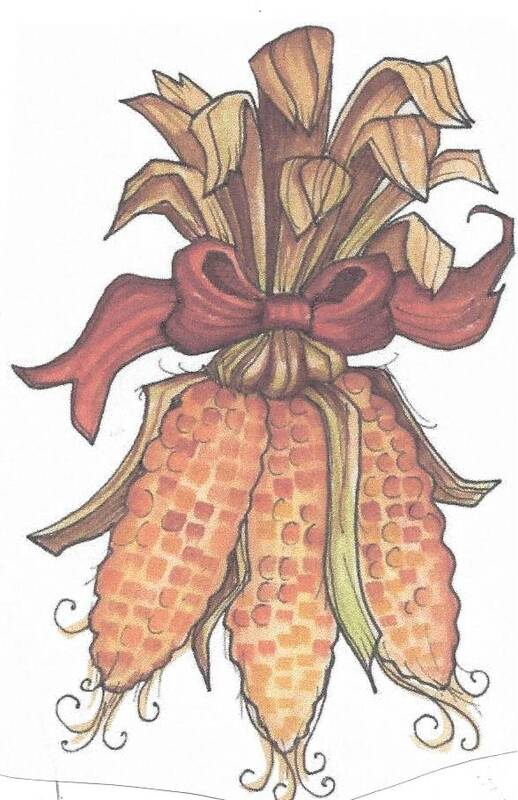 Public bids came in and the winning bid would have been $184,094.60. From March 18, 2013 to October 26, 2017, the Board of Supervisors had spent $68,886.25 on this lie. The Board of Supervisors tabled this issue never to return to any Agenda. 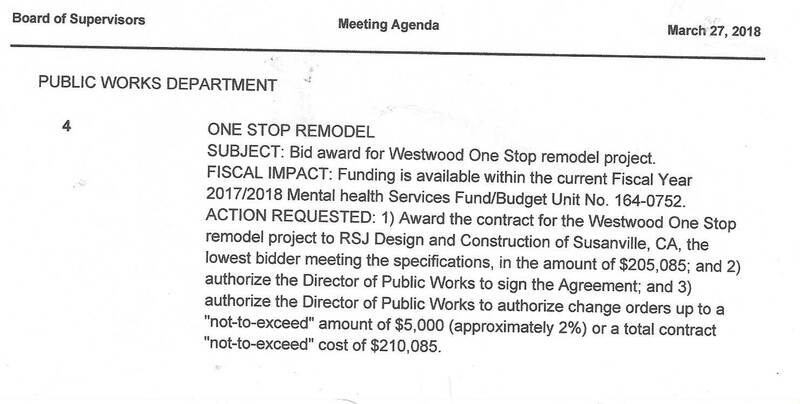 Lassen County Supervisors issued a Request for Proposal, on October 17, 2017 for remodel work at the Westwood One-Stop. The bids were received on November 9, 2017. 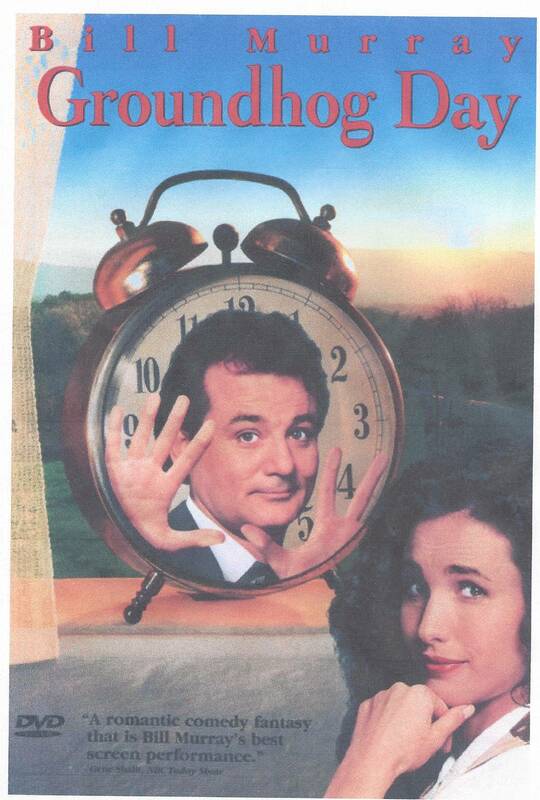 The low bid was $297,393. This was more than a fair bid for the work the County required. Kan We Help will be there! This process has become a joke. The County bids these jobs out and never awards them. Lassen County was given a Grant of $788,000 in 2009 to upgrade the One Stop facilities (Bieber, Westwood & Herlong). They have managed to piss away $100,000 by ordering studies and useless architectural drawings (never used). Herlong One Stop received a new roof and HVAC "fixes"
Westwood One Stop has received NOTHING ? More money spent to get NOTHING ! Lassen County was awarded a Grant of $788,000 in 2009 and if they don't piss the money away they will have to give the money back in 2018. Family Service Centers/ One Stop employees again traveled many miles [ as they have done for years] to be present for Agenda Item H-1. The Supervisors did what they normally do, they shelved it. 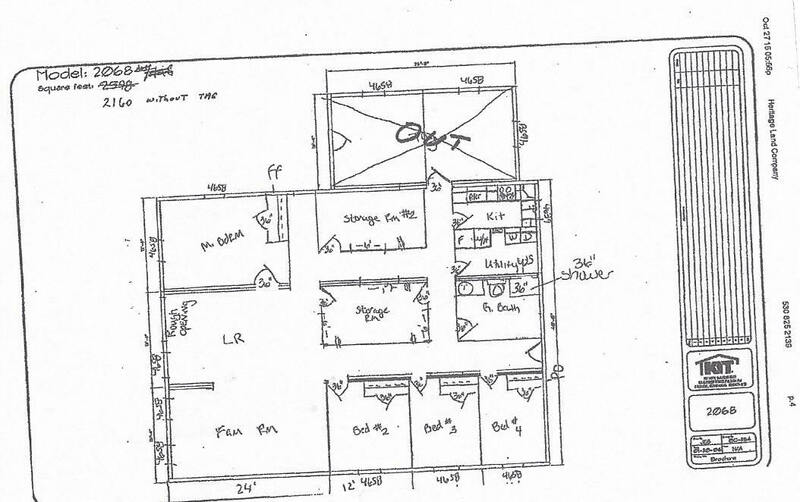 A 2009 Lassen County capital improvement project that is yet to be built even though the States $788,000 Grant money still sits in the bank to expand this facility. This project had no fiscal impact on the General Fund. This CIP was funded through the Mental Health Services Act and the Supervisors continued to waste this Grant money . At the May 12, 2015 meeting, the Employees at the three Family Resource Centers (Beiber, Herlong and Westwood) asked for help. The One Stops currently get $10,000 support from the Supervisors. 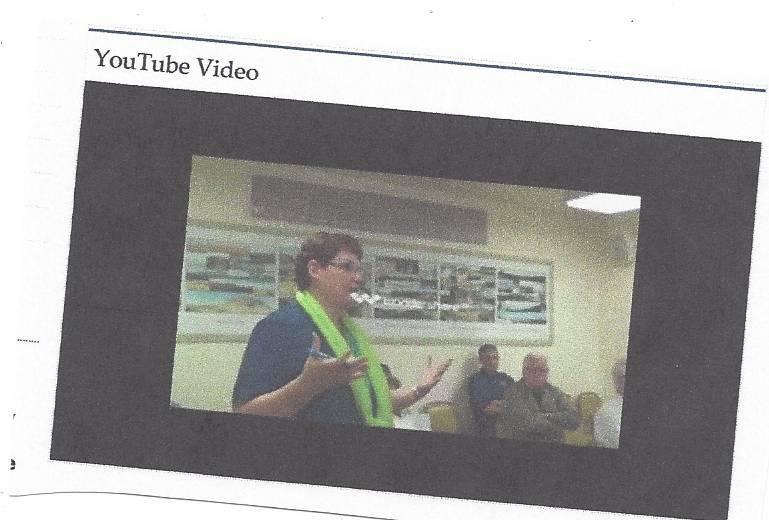 At the May 19, 2015 Board of Supervisors Meeting, County Counsel attempts to keep the One Stop Employees from Speaking. 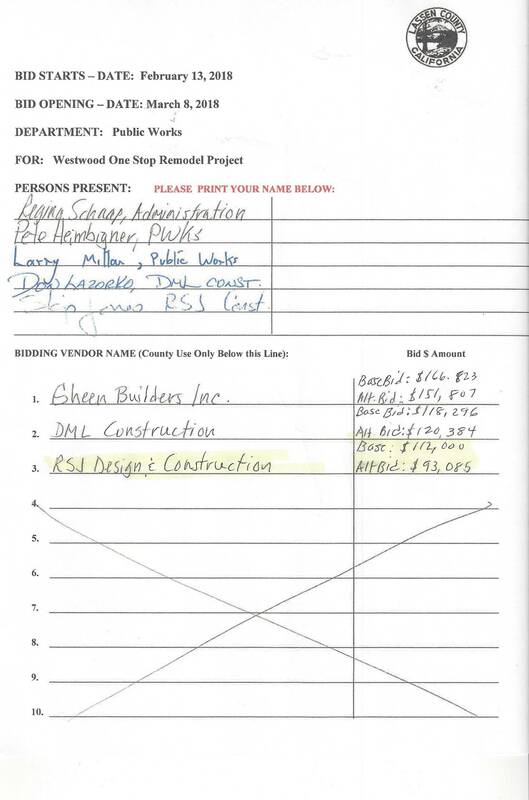 Public Works Director Peter Heimbigner ordered these plans knowing the cost to build would exceed the Grant money? The Caretakers of the elderly and disabled in Lassen County have been attending the Supervisors meetings for months and have pleaded to have their budget increased. Currently the Herlong, Westwood and Bieber "One Stop" Resource Centers receive $10,000 a year. The Supervisors want them to raise their own money because they would feel better.